Free To Enroll. No Early Cancel Penalties. Just A Lower Electric Rate. How Does My Electric Rate Change? New Hampshire is an energy deregulated state and residents have the power to choose their electric supplier. This means its your right to shop for a better electric rate. Town Square Energy is a retail electric supplier that is licensed to offer you these alternative rates to the utility price. Think of it like this, if you felt the corner gas station had a great price per gallon and offered you the opportunity to lock-in that price for six months, a year?…would you do it? Electric rates fluctuate all the time and Town Square Energy helps people lock-in when the time is just right. 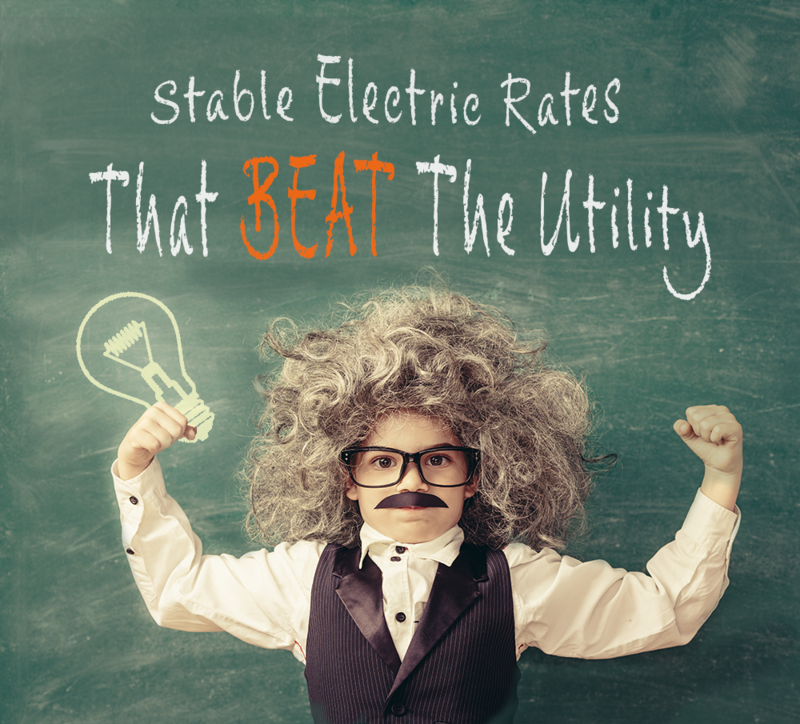 If you are looking to lower your electric bills this winter and lock into a great electric rate, there is no better time. Does it cost me anything to enroll and switch to Town Square Energy? No. 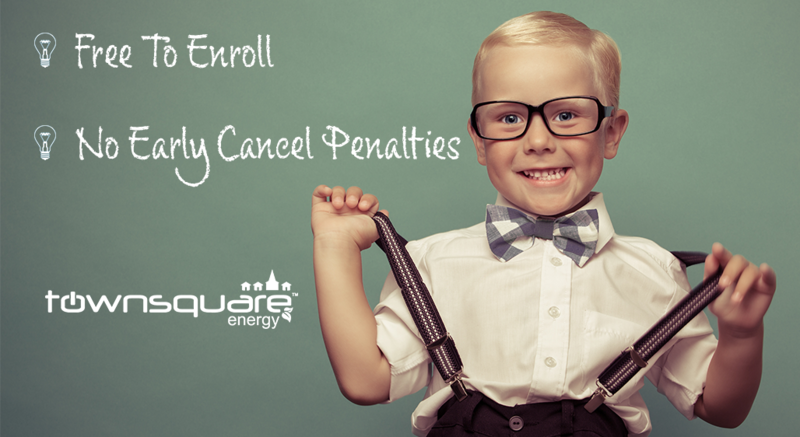 Enrollment is free with no penalties for canceling early. We will only need your current utility account number so we may alert your utility that you have chosen a new electric supplier. Will My Electric Rate Jump To A Much Higher Price When My Term Is Up? Town Square will alert you via e-mail, phone, and by mail well before your term expires. This will allow you to shop and choose a new rate once your term is up. If you do not choose a new rate, Town Square will roll you onto a new competitive rate plan. When you enroll with Town Square Energy, we alert the utility of your new rate. The utility still handles grid service, outages, and billing. The only thing that changes is the rate you’ll pay per kWh. Click here to see all the plans currently being offered in the New Hampshire Eversource service area or enter your zip code above. Compare the price to the current utility rate and the term length for each plan. Once you choose a plan you may either enroll online or you may call our customer care group at 1 (877) 430-0093. You will need a current copy of your utility bill to complete the process. Once we receive all of your information, we alert the utility of your choice to switch electric suppliers. Town Square Energy will send you a confirmation via e-mail, post, or phone call… its your choice. Your new electric rate will take effect in 15-45 days, depending on your current billing cycle. Town Square Energy has 1000s of customers in 8 states across 27 utility markets. We provide alternative electric rates to all of our customers with award-winning customer service and transparent operating principles. All of our customer care representatives are based at our headquarters in Chandler, Arizona. We are BBB Accredited and fully licensed in every state we operate in. Want More Information? Give us a call, we would love to help. 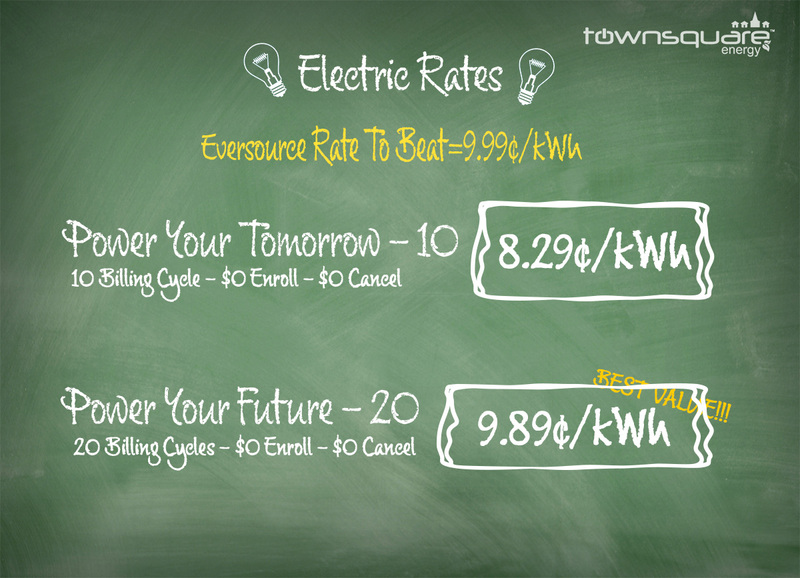 *Rate comparison is based on the current posted Eversource electric rate of 9.99¢/kWh as of 1/1/2016. Town Square rates and plan terms are subject to change without notice. Actual savings may vary based on usage. Rate offers above are for residents living in the Eversource of New Hampshire service areas and may change based on service address.